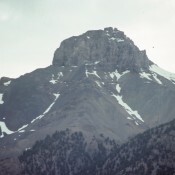 Mount McCaleb is one of Idaho’s most prominent peaks when viewed from US-93 near MacKay, Idaho. Most people climb the peak via the saddle between it and Little Mac but there are a number of other interesting routes on the peak. See Livingston Douglas’ more detailed route description for the West Ridge Route below. Livingston has also provided climbing directions to reach the USGS benchmark on McCaleb’s subsidiary summit Point 11592. Lower Cedar Creek Road [(B)(13)] is the standard approach. However, it is currently closed to the public at 1.2 miles up from the Bench Road, though there is a rough ATV road that goes sharply right at that point to skirt the private property, crosses the bushy Lower Cedar Creek drainage then turns north but ends about a mile before reaching the mouth of Lower Cedar Creek Canyon. 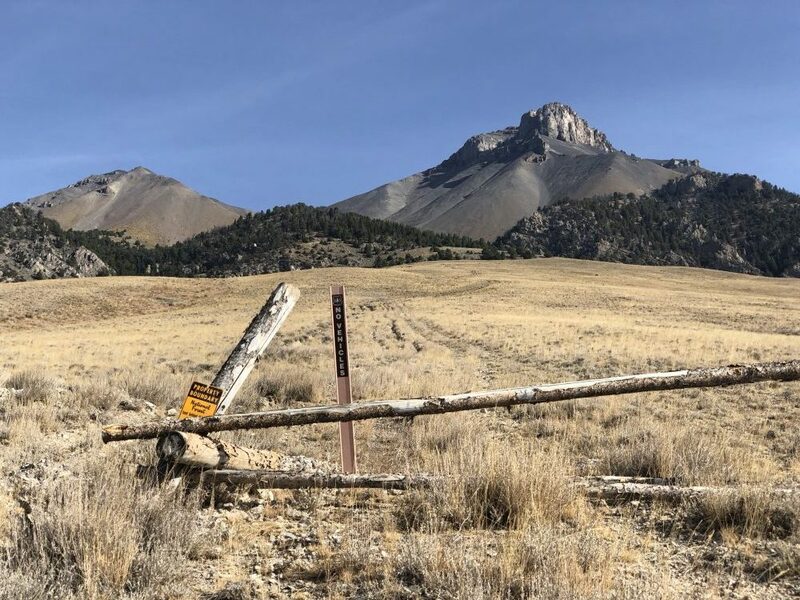 For passenger vehicles, you could park at the closure point and hike up the ATV road then bushwhack across Lower Cedar Creek to regain the Lower Cedar Creek Road above the private property closure. Unfortunately, this requires almost 3 miles of hiking to reach the mouth of Lower Cedar Creek Canyon. Until public access is regained, here is an alternate route that I discovered. 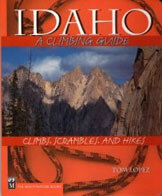 It works well for climbing Little Mac, Mount McCaleb, and hikes up the Lower Cedar Creek Canyon (e.g., Limestone Peak). Passenger vehicles can make it to a parking pullout just before Nielsen Ditch; high-clearance vehicles can go just over 1/4 mile farther up the road. By the way, this road is clearly shown on the Mackay quadrangle. It ends on a bench at the mouth of Lower Cedar Creek Canyon on the left/west side of Lower Cedar Creek. From the intersection of Highway 93 and Main Street in Mackay, drive NE on Main Street 0.5 mile to where it intersects the Bench Road. Turn R/SE on the Bench Road and you’ll soon reach the entrance to the Mount McCaleb Cemetery. From the cemetery entrance, drive 0.7 mile SE on the Bench Road to the recycling center (on your left) and cross a cattle guard. Immediately after crossing the cattle guard, turn left/north onto a BLM road; reset your odometer to 0.0 This road aims directly at the mouth of Lower Cedar Creek Canyon. It follows the RHS of the recycling center initially. After passing the recycling center, the road doglegs left then right. At 0.7 mile, go straight at a junction. At 2.4 miles, the road crosses under the power lines and crosses the power line road. At 2.5 miles, the road reaches a cattle gate. At 2.7 miles, the road reaches Nielsen Ditch. Pull off to the right here and park (unless you have a high-clearance vehicle). The elevation here is 6,680 feet. This is where the route begins. As a result of the southern access routes I looked for an alternative access route for Mount McCaleb and Little Mac. 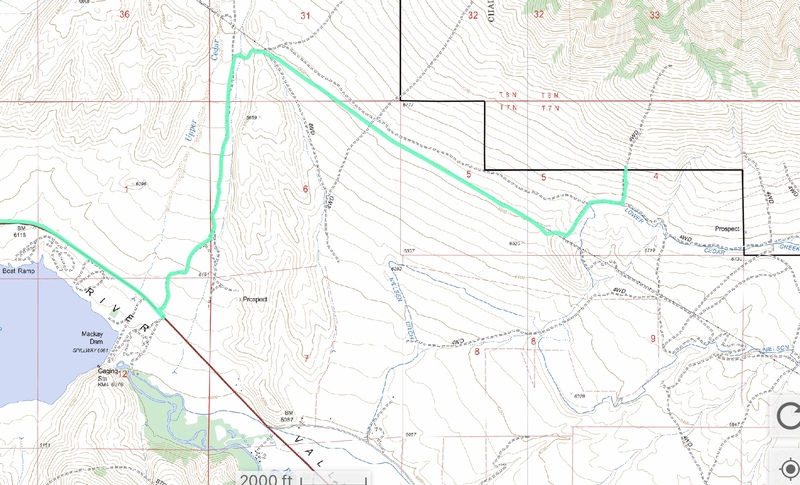 I determined that an access route off of US-93 was on public land. The road leaves the highway just south of the turnoff for the Mackay Reservoir dam. The gate is found at this waypoint: (43.956052, -113.668124). I proceeded through the gate and was able to get to my intended staring point. 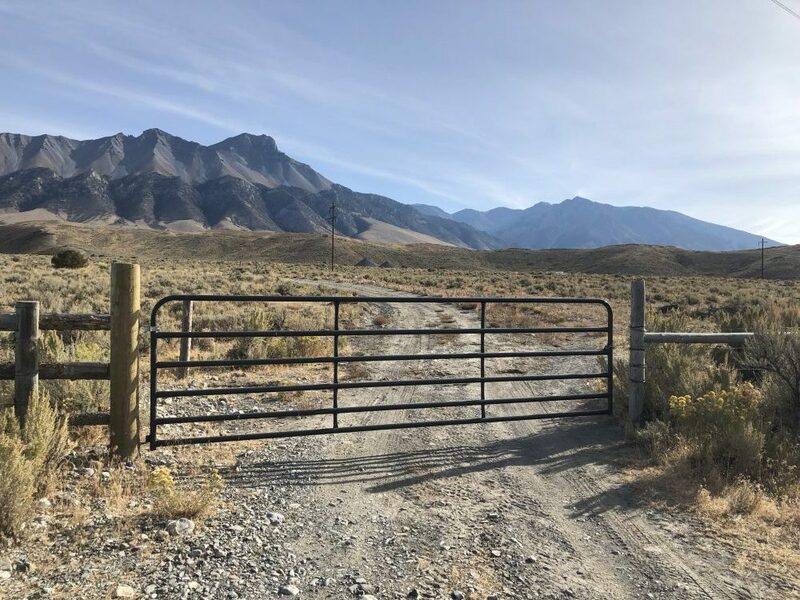 Once upon a time you could drive from my starting point up to 8,200 feet but the tracks had been deeply rutted and rerouted so many times that the Forest Service finally closed this steep route and installed a wide fence with a ‘No Vehicles’ sign at 7000’ This is where my GPX ends. Derek’s GPS Track for the approach route. 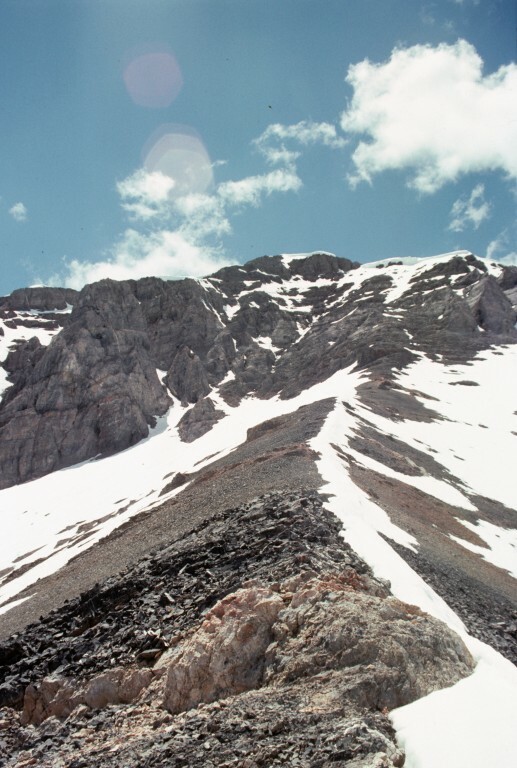 The access road to the start of the route between Mount McCaleb and Little Mac is shown in this photo by Larry Prescott. Check out Larry’s trip reports for some truly outstanding photos of his climbs. While not as popular as the route from the West Ridge Route from Little Mac/Mount McCaleb saddle, the east ridge is an enjoyable and challenging scramble. Approach from Lower Cedar Creek and climb the first major gully leading up to toward the east face. Climb this talus filled gully to the east ridge. Follow the ridge toward the summit. The last 100 feet are quite steep and hovers between Class 3 and 4 in difficulty. Looking up the Long Gully which climbs out of Lower Cedar Creek toward the peak’s east face and east ridge (on the left). 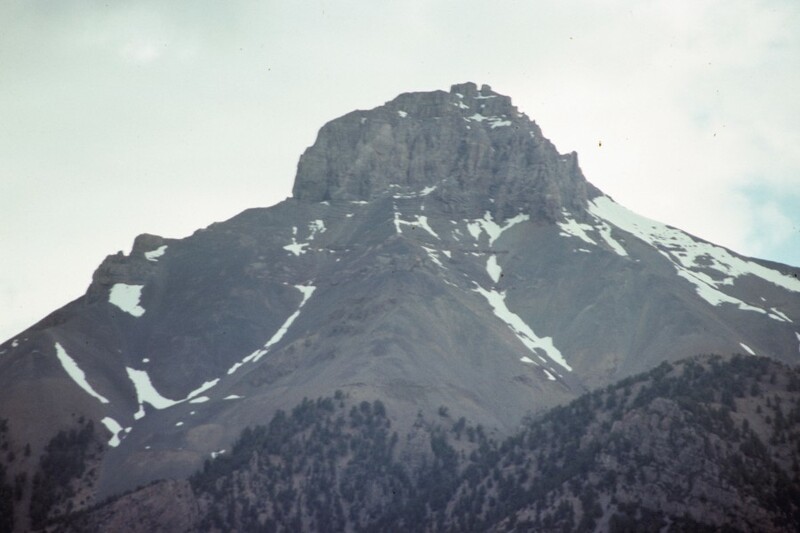 East face of Mount McCaleb. From the flat area on the South Ridge of Little Mac (please consult the South Ridge Route for Little Mac for details on how to reach that point), traverse diagonally into the large gully separating Little Mac from Mount McCaleb. Now, as Tom Lopez says, “climb the north/south gully to the west ridge.” The gully climb is a combination of boulders, talus, and scree. It’s just a Class 2 slog up to the Little Mac/Mount McCaleb saddle at 10,660 feet. I descended this part of the route since I climbed the South Ridge of Little Mac and then descended its East Ridge to reach the aforementioned saddle. While this route is commonly called the “West Ridge Route”, in reality it is the “West Face/Northwest Ridge/North Ridge Route”. That’s how it actually plays out, and you can see this on the Mackay quadrangle. Just saying. And it’s not of Class 3 difficulty; it’s only a Class 2. From the Little Mac/Mount McCaleb saddle, scramble east up the West Ridge, which is more of a face initially. You will find some goat trails here to help you make headway up the loose scree. For better footing, you’ll eventually move leftward to gain the Northwest Ridge, which is much better defined than the West “Ridge” that you just climbed. This ridge forces you to turn rightward/southeast. You will find a climber’s trail from here to the summit. This trail is on the ridge crest or on its southwest side. This trail is in loose scree, so it’s a better descent path than an ascent path. After a couple hundred feet of ridge climbing (Class 2), you will reach the North Ridge. 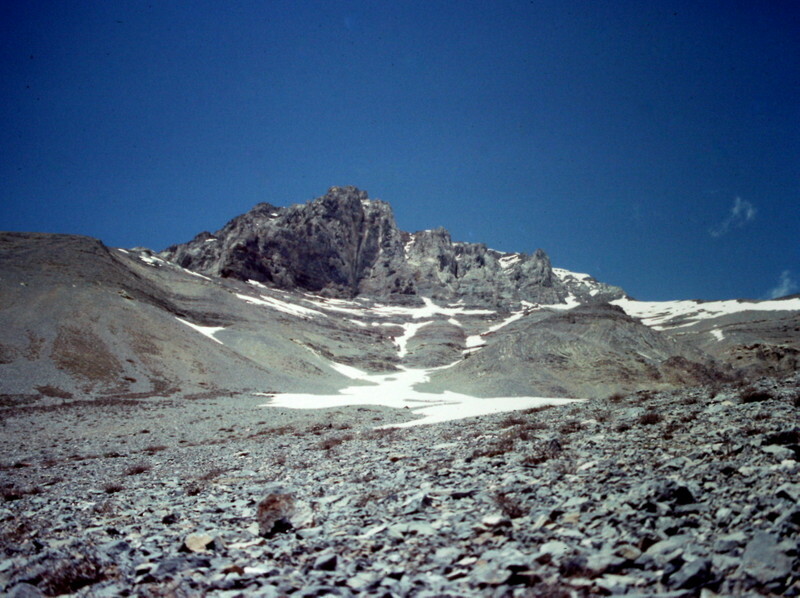 Follow the ridge south to the narrow, elongated summit area of Mount McCaleb. There are two points that appear of equal height here. Stand on both of them just to be sure that you’ve achieved your goal. From the summit, you are treated to a spectacular view of the metropolis of Mackay, Idaho. 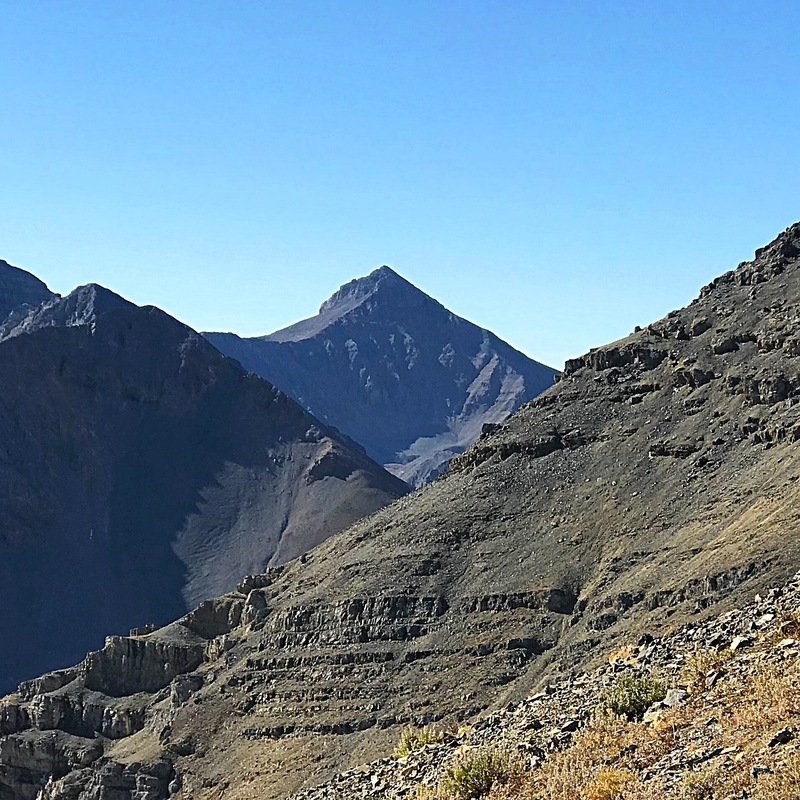 If you wish to continue on to climb the McCaleb Benchmark (11,592′), you can see it to the south (cairn with large post in it) amongst a series of ugly ridge towers. McCaleb Benchmark is a much harder climb than either Mount McCaleb or Little Mac. Point 11592 is not in the book. It is a satellite summit of Mount McCaleb and is not a ranked summit. But it is a challenging, short scramble from the summit of Mount McCaleb. 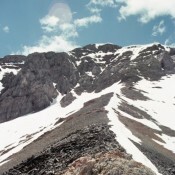 This route begins at the summit of Mount McCaleb. Please consult the West Ridge Route for Mount McCaleb for information on how to reach the summit of Mount McCaleb. From the summit of Mount McCaleb, first get a good look at which tower is summit of McCaleb Benchmark (BM). The correct one has a large cairn and a tall post on top of it. From McCaleb’s summit, descend south along the broken scree of the narrow ridge to find a chute on the west side of two ridge towers. Descend the chute to bypass the towers and reach the base of the tower that is the summit of McCaleb BM. The north side of the summit tower is a risky, exposed Class 4 climb. To avoid this, drop another 10 feet or so to go around to the south side of the summit tower. Climb a Class 3 chute then a steeper Class 3+ chute to access the South Ridge of the tower. Once up on the ridge, it’s an easy stroll north to the [surprisingly] luxurious summit. A different view of Mount Mccaleb. This photo is from the northeast.